As the temperatures drop outside, the potential for fires increase inside. An average of seven people die in U.S. home fires every day, according to statistics by the National Fire Protection Agency (NFPA). In the NFPA’s most recent report on Home Structure Fires, general causes, including cooking and home heating, account for 84 percent of these incidents. While the numbers are alarming, knowing the causes leads the way toward preventing future fires from ever occurring. Stop fires from starting in your home by understanding the root of the problem and using the prevention tips provided to keep your structure safe. Gathering around the dinner table for a feast with family and friends should be a relaxing and joyous occasion. However, cooking leads to the most home fires, causing 46 percent between 2010 and 2014, with 19 percent leading to death and 44 percent leading to injuries. 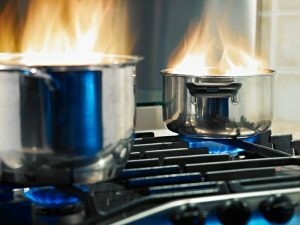 The NFPA lists Thanksgiving as the peak day for cooking fires, but it’s not the only time of year when a meal can cause a home to go up in smoke. Be present: Always keep an eye on foods when frying, grilling, or broiling, or when cooking food over an exposed heat source, such as a gas or electric stovetop. If you need to leave food unattended, turn off the heat source before doing so. Keep cooking areas clear: Make sure flammable materials, including clothing, kitchen linens, home decor, and food packaging materials, are kept away from the heat source when cooking. These items are easily ignitable and can catch fire quickly. Be warned: Install smoke detectors at least 10 feet away from cooking appliances. Don’t be a hero: If a fire starts in your kitchen, leave immediately and call 911. The second most leading cause of home fires is heating equipment, with most incidents occurring in December, January, and February. Two out of every five home heating fires and four out of of five home heating deaths found space heaters–portable or stationary– as the cause. Other leading contributors included chimneys and placing flammable items too close to heating equipment. Safe zone: Create a three-foot barrier around heating equipment, such as fireplaces, space heaters, or furnaces. Don’t allow items that can easily ignite–furniture, drapery, clothing, bedding–to enter into this safe zone. 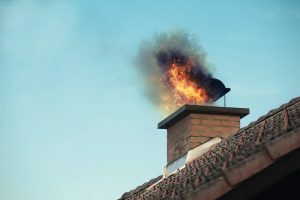 Clean it up: Chimneys can build up creosote, a highly combustible byproduct of wood-burning fires. It’s important that your chimney is cleaned by a professional at least once a year–more if you use your fireplace or wood burning stove as a main source of heat. Power down in the p.m.: Before going to bed or leaving your home, be sure all portable heating devices are turned off and are no longer warm. Set up a screen: Install a screen or set of doors on the front of your fireplace to avoid sparks from flying into the room. 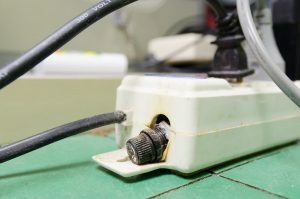 Avoid overloading: Only plug in one high-wattage appliance per outlet at a time, and always follow manufacturing guidelines regarding wattage needs for appliances. Cord control: Replace or repair loose and damaged electrical cords. Also, avoid running extension cords in high traffic areas, such as in front of doors and under rugs or carpeting. Circuit smarts: Install ground-fault circuit interrupters (GFCIs) in kitchens, bathrooms, basements, and laundry rooms. You can also protect electrical outlets by installing arc-fault circuit interrupters (AFCIs) in your home. Call in a professional: Seek the advice and aid of a qualified electrician for problems such as outlets or switches that are warm to the touch, frequently tripped circuits or blown fuses, or lights that flicker or dim.